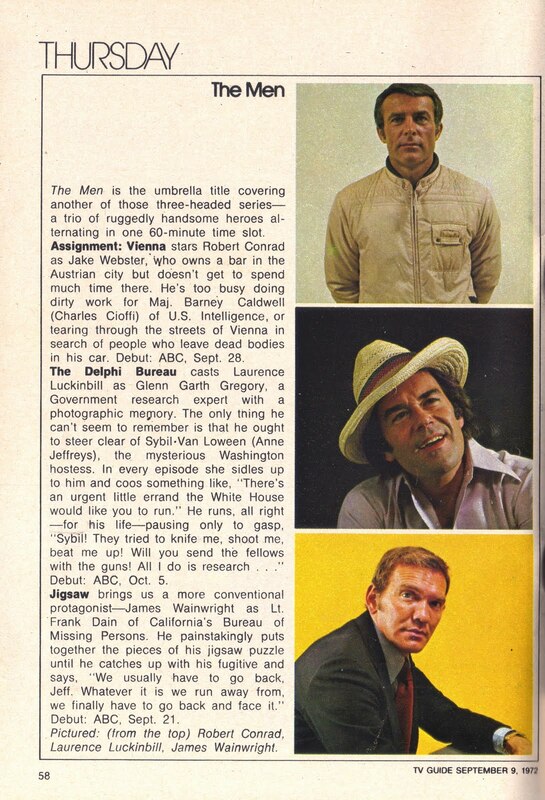 News reported here recently that the pilot film for the 1972-1973 ABC-TV crime/adventure drama The Delphi Bureau has been released by Warner Archive dredged up from my memory the “wheel series” of which Delphi was merely one element. So I went looking through YouTube, and discovered the 1972 Fall Preview video--posted above--which introduced Delphi and its two other alternating shows, all of which were broadcast under the umbrella title The Men. For those who aren’t old enough to remember, The Delphi Bureau featured Laurence Luckinbill as Glenn Garth Gregory, a handsome guy with a photographic memory who’s employed by an indistinctly defined U.S. government agency that does obscure “research” work for the president. “Its actual role was counter-espionage,” recalls Wikipedia, “and its main operative was Gregory, whose liaison with the group’s unnamed superiors was Sybil Van Lowreen (Anne Jeffreys), a Washington, D.C., society hostess. (Celeste Holm had played Sybil Van Lowreen in the series’ pilot film. )” Unfortunately, only seven episodes of Delphi were shot before The Men was cancelled. After six episodes were produced, the studio or the network brought in Roy Huggins to punch things up. Huggins began by jettisoning the cop format. The vehicle for the change was Howard Browne’s oft-filmed  novel Thin Air (which would later be the basis of episodes of The Rockford Files and Simon & Simon, among others) in which a man is suspected of murder after his lady friend walks into a restaurant and vanishes into … you guessed it. Stephen [J.] Cannell wrote the script [for that episode, “Kiss the Dream Goodbye”], which ended with Dain clearing his name and getting his private ticket. Huggins plotted the next episode, then the network ran the final unaired cop episode and the show vanished. My memory of the series in general and the P.I. episodes in particular was that it was well-done and played straight; no Rockford-style humor. Huggins and Cannell undoubtedly would have done a good job with a low-key lone-wolf character and the missing-persons hook, but ABC gave them Toma to do instead. And, of course, a year later NBC provided them the Rockford opportunity. In the larger scheme of things, as promising as the still-born Jigsaw might have been, The Rockford Files was, to say the least, the better path for Huggins and Cannell to follow. Assignment: Vienna--which followed a 1972 pilot film, Assignment: Munich, featuring Roy Scheider in the Webster role--seemed to offer considerable promise. As I remarked in my previous post about that show: “It had the talented pair of Eric Bercovici and Jerry Ludwig (who’d worked previously on episodes of Mission: Impossible) as its creators and executive producers. It had a terrific, intrigue-filled theme by jazz pianist and composer Dave Grusin (who had composed the theme music for Burt Reynolds’ Dan August and Robert Wagner’s It Takes a Thief, among others).” And in Conrad it boasted a bankable star, a pretty boy who nonetheless carried a tough demeanor suggesting he’d taken a few punches in his time and knew how to throw more of his own. (In fact, Conrad had been a pop and rock singer before he embarked on an acting career.) Furthermore, this final spoke of the Men wheel was shot in European “locations of intrigue and adventure,” giving it a freshness that other programs filmed around New York City or Los Angeles lacked. Yet, once more, Assignment: Vienna was yanked from the TV schedule after only eight episodes. Warner Archive’s DVD release of The Dephi Bureau pilot gives me hope that it will follow up with a complete packaging of the series. And maybe that will incite the sale of both Assignment: Vienna and Jigsaw in the same format. I’d love to see them all once more--complete with the Isaac Hayes theme that originally introduced The Men. The video clip embedded at the top of this post comes from a longer ABC Fall Preview--the first of two parts--found here. An episode-by-episode index of The Men is here. Was that Burgess Meredith driving that tractor? I almost remember the Delphi Bureau. I turned 12 in 1972, so most of it went over my head. I fondly remember The Delphi Bureau, especially the pilot. Luckinbill was great. I think the show was created by the same guy who created Man from U.N.C.L.E. and co-created Have Gun Will Travel, Sam Rolfe. The setup for Assignment: Vienna and/or Munich always struck me as being much too similar to Ross Thomas' novels featuring Padillo and McCorkle. Does anyone remember a series with Dane Clark set in a bar in a tropical area. He solve mysteries in black and white in 30 minutes. to Gram: Just go to Imdb.com and look over Dane Clark's TV credits. There's one TV series called "Bold Venture" that might be what you're thinking of. It was set in Trinidad and Clark played Slate Shannon, an adventurer who lived on a houseboat. There is, however, no mention of Clark being a bartender or bar owner.